To help me make my mind up, a quick trip in a 16 Valve Delta Integrale was needed and the example currently available at The Classic Motor Hub offered a chance to make a comparison to my own Delta Integrale Evo II. Rumour has it that the 8v and 16v cars are the better car to drive, and that Evo IIs are often preferred just for their boxy looks. Evidently, some real-world road testing was required. The differences from the outside are subtle but noticeable. The 16v does not shout about its rally pedigree whilst the Evo II positively screams about it. For example, the 16v has a slimmer track (the front wheels still bulge but clearly less so than the Evo II); the 16v’s bonnet has the sculpted bulge but the Evo II has extra bonnet louvres either side of the crease for better cooling. Lastly the 16v doesn’t have an adjustable rear spoiler, usually seen in full-on rally nutter mode on Evo IIs. 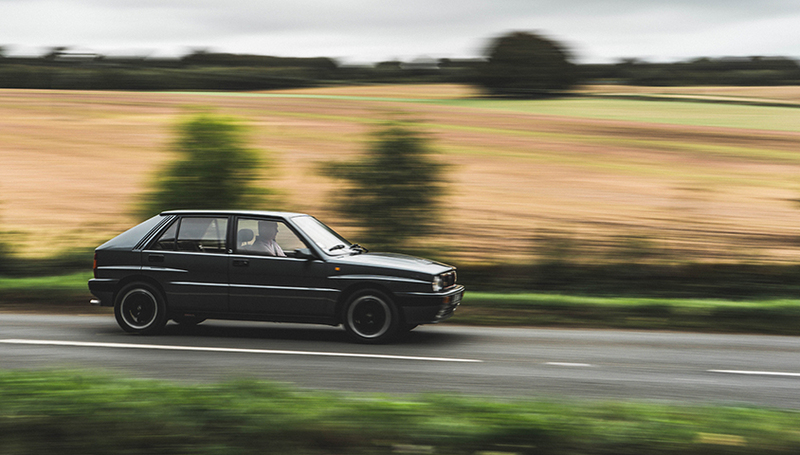 This 16v Lancia Delta Integrale is a great example. There are no stress cracks in the usual places, no rust in the rear cross-member, a well-serviced engine with no aftermarket modifications and the original interior (except for a modern radio). 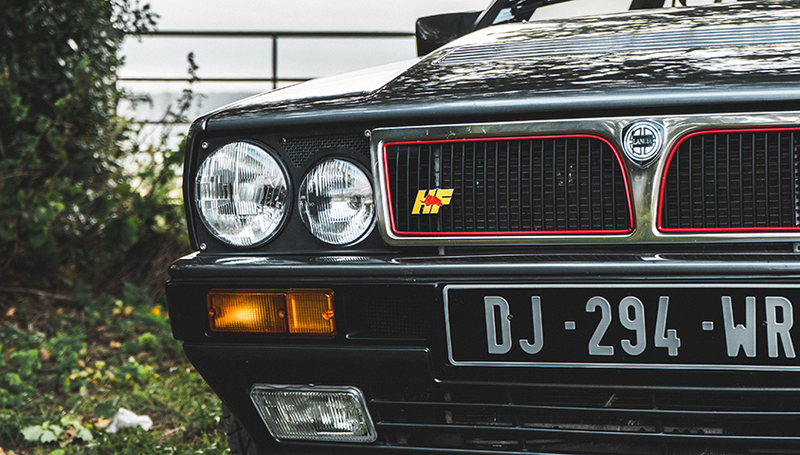 For the uninitiated, the Lancia Delta Integrale won 6 World Rally Championships on the trot. Their Group A car was and still is the most successful rally car of all time. Their rally history began following the banning of the monstrous Group B cars after several unfortunate accidents in 1986. Lancia turned to the 70s Delta hatchback to cram in 4-wheel drive technology and turbocharged engines to create the Integrale. Thanks to more stringent homologation regulations in period, the road cars of this era were closer than ever to the very cars that raced in period. In fact, the very reason the 16v exists as we know it today was because the Rally team increased the horsepower of the 8v car that came before it and widened the track for the 1989 season. When compared to the Evo II, the differences in driving a 16v are noticeable right from the off. All Integrales seem to take an age to get up to temperature, perhaps building the excitement that awaits as you wake up your inner Juha Kankkonen. Once up to temperature and out on the open roads, the the car instantly feels nimbler than the slightly heavier Evo II, with the lighter steering allowing the 16V to float over bumps in the road. A good way to measure the damping on Integrale is to listen to the characteristic squeaks rattles in the cabin as you dip a wheel through a pot-hole, and on British B-roads at least, bumps generated less cabin noise than on my Evo II. Lighter steering doesn’t necessarily mean less feel, and somehow I felt a little less connected to the car than the later Evo II which requires some strength to turn the wheel. Some of that feeling undoubtedly comes from the seats of the 16v. Evo IIs come with winged Recaros as standard which you very much sit in as opposed to the regular hatch-back seats of the 16v which you merely sit upon. The power delivery is probably the most significant difference. The 16v was the first in the Integrale series to feature a smaller and more responsive turbo charger and hence has less lag. The ‘magic carpet’ woosh of the turbo comes from lower RPM than the later car and hence gives a smoother sensation of acceleration. In an Evo II however, the turbo kicks in like a hammer drop. You put your right foot down and wait (quite a while) to be catapulted down the road before changing gear and boosting off again. Overall these Delta Integrale are much more different to drive than I had ever imagined and there is no better or worse in my opinion. With values of a good Evo II becoming pretty steep, a 16v as nice as this one should definitely not be seen as a second choice car. Does it deserve to be chopped up for an Automobili Amos resto-modification? I don’t think so. However, what Automobili Amos are doing is very encouraging for Delta owners. They could have chosen any Italian car to ‘rebirth’ but the fact they chose the Integrale speaks volumes for the passion these cars instil. Integrales have long had a cult following and owners past and present are wistful eyed when discussing their cars and need no convincing that they have all the hallmarks of a future investment-grade classic car. Racing pedigree, phenomenal driving feel, rarity and interesting styling. Values of the Delta Integrale have long been climbing, and much like Singer have focussed on classic 911s causing their own prices to surge, Automobili Amos has shone a spotlight directly in the face of the Integrale which shows there is still a lot of investment growth left in these Italian rally icons.